Walking has a variety of health benefits, from reducing mental stress to weight loss. As you are walking and running more for Move a Mile May, proper footwear is very important. After Bill opened his first store nine years ago, he has grown Runners to have locations in Saginaw, Bay City, Midland and Mt. Pleasant. “I wanted to bring forth a store that specialized in fitting. We want to concentrate on having a place where we can educate you on footwear,” Bill said. “We specialize in the fitting process as far as analyzing your gait, how your foot comes in contact with your ground and the shape of your foot." Runners carries a variety of brands, including Vibram FiveFingers, Brooks and Saucony. Interested in improving your mental health at the same time as your physical health? Go for a walk! 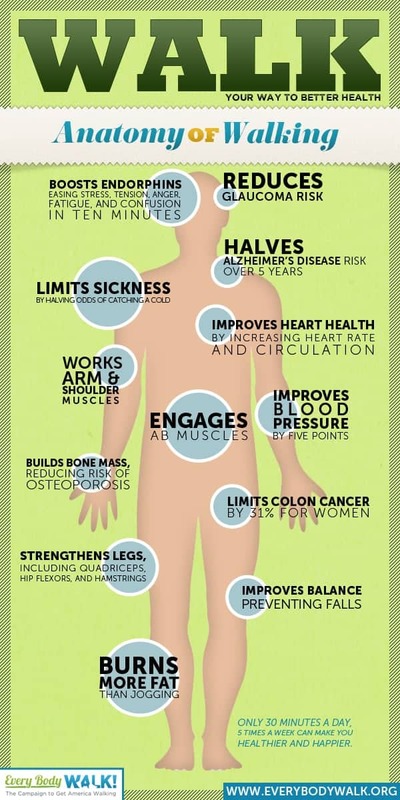 Many people know that walking has a variety of benefits, from increased strength to weight loss. But many people don't know that walking can also have significant mental health benefits. Better mood: Walking 30 minutes a day boosted the moods in depressed patients faster than antidepressants research by the British Journal of Sports Medicine found. Walking releases endorphins increasing your mood and decreasing pain. Better brain: Age-related memory decline is lower in people who walk more. A study by the University of Virginia Health System found that men older than 71 who walked more than a quarter mile per day had 50% less incidences of dementia and Alzheimer's. Better relationships: Take a break from work, chores and the TV and go for a walk with your family or friends. Daily walks are a great ritual to talk about your day and relieve stress while exercising. Better sleep: One-hour walks in the morning were shown to relieve insomnia in a study by the Fred Hutchinson Cancer Research Center in women ages 50 to 74. Are you still reading this article? Get up and go for a walk already! Did you do the May health resolution? "My goal is to run 1,000 days in a row"
For the May health resolution, Kehres Health has challenged you to move a mile for 30 days in a row. Steve Rose has completed that goal… multiplied by 27! Currently on a streak of 383 days, Steve is working to hit 1,000 days in a row. He says there are both physical and mental benefits of running. 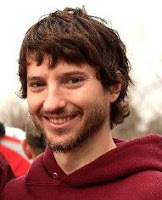 Originally from Essexville, Mich. Steve, 25, ran for Essexville-Garber High School and then at Alma College (which is also my alma mater, Go Scots! ), where he holds the record as 5th fastest in the 800m race. 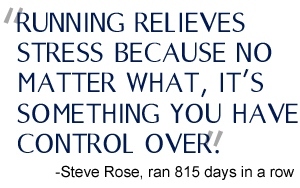 Steve says, “For the most part I found running every day to relieve some of the stress from my day. No matter what, it's something you have control over. You can go fast or slow and basically anywhere that you want. Nobody's telling you what you have to do and that's what's great about it. On my easy workout days I like to go slower than usual and take scenic routes to just enjoy myself. Currently residing in Alma, Mich., Steve is the Head Diving coach for Alma College, a Life-Guard Supervisor and an Assistant Track Coach for the Breckenridge High School team. His previous record was running 815 days in a row, but had to stop due to injury. However, he came back from a torn esophagus that required a two week hospitalization and several months of recovery before he could run again. Good luck Steve on reaching your goal of 1,000 days of running in a row, Kehres Health is cheering for you! Are you moving a mile every day this month for the May health resolution? Setting goals is necessary to accomplish goals. Do you want to make exercise a priority in your life? Sign up for an upcoming race! Find races in your area at active.com or runlocator.com. I'll be walking with Team Amigo Mobility, you're welcome to join us! Enter to win a $50 gift card to Runners Performance Store! Mark every day you walk or run at least a mile in May and turn in to Kehres Health. The more you move, the more entries you'll receive. 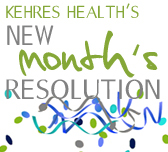 Learn more about our Kehres Health New Month's Resolutions. Home from college for the summer? Take advantage of the college student special at the Saginaw Athletic Club, three months for $75! Learn more about the Saginaw Athletic Club and see Dr. Kehres' interview with SAC owner Ryan McGraw. Move a mile every day! Walking, just like breathing and eating, is one of the most natural things you can do. Unfortunately, less than one third of the U.S. population gets enough physical activity throughout the average day. Although walking isn't always the best way to shed pounds for someone trying to lose weight (for weight loss, try burst training) it does have a variety of health benefits. From reducing your risk of stroke, heart disease, diabetes, treating arthritis to reducing your mental stress walking could be one of the most powerful "drugs" ever created. As Bill Phillips says, "Exercise is the most underutilized antidepressant." Almost anyone can tolerate walking as it has minimal impact on the joints and you can do it anywhere! Make going for a walk part of your daily routine this month and commit to at least a mile. Whether you take your dog for a walk in the morning, walk during lunch with co-workers or take the whole family out for a walk after dinner -- these 20 minutes a day will benefit your physical and mental health! Print this calendar to hang on your fridge and mark every day you go for at least a mile walk or run. Move a mile everyday in May, and we'll enter you to win a $50 gift card to Runners!